On the island of Taiwan, formerly Formosa, the climate is tropical, with mild winters and hot, rainy summers. The period May-September is very rainy throughout the country because of the summer monsoon, while in the other seasons, rainfall depends on latitude and slope exposure. However, winter is the least rainy season everywhere. In winter, the temperature is pleasant in the south, where highs in January are about 23 °C (73 °F), and the sun often shines, while in the north (see Taipei), the climate is cooler and cloudier, with average maximum temperatures about 18 °C (64 °F). Owing to maritime influence and low latitude, night-time temperatures are rarely cold and never drop below freezing (0 °C or 32 °F). However, sometimes, there can be very cool days in the north, with highs about 10/12 °C (50/54 °F). In spring, in April and early May, early thunderstorms begin to occur in the afternoon, starting from the north and the interior. The monsoon arrives on the island around May 10 - May 20, coming from the south. It brings heavy rainfall throughout the island, but especially along the southwest coast, from Tainan to Hengchun, in addition to the highlands of the interior. Summer is hot, humid and rainy, with more frequent rains (unlike in winter) along the southern coast. The temperatures are uniform from north to south: in July and August, the daily average in the plains hovers around 29/30 °C (84/86 °F). The north-west coast, from Taichung to Taoyuan, experiences a relative decrease in rainfall in July. Since the tropical rains are usually intense but short-lived, the amount of sunshine in summer is acceptable, however, in this season, sticky and unpleasant heat dominates. During summer, the island is often affected by typhoons, the tropical cyclones of South-East Asia, able to bring strong winds and torrential rainfall; they typically cause heavier damage along the east coast. After the monsoon, in autumn, from October to December, the rains decrease and the muggy heat is replaced by more pleasant weather conditions. The only area which remains fairly rainy is the east coast, where more than 100 millimeters (4 inches) of rain fall per month still in autumn (see Hualien). 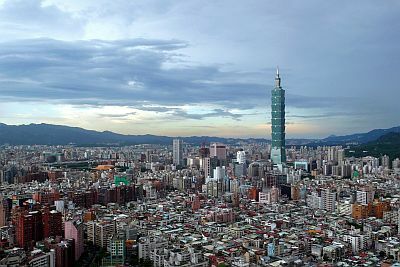 The capital, Taipei, is located in the northern part of the island, which is the rainiest along with the north-east, and is the coolest in winter. The average temperature ranges from 16 °C (61 °F) in January to 30 °C (86 °F) in July. In summer, the "urban heat island effect", generated in the big city, makes the heat even more unpleasant, but the buildings are fortunately equipped with air-conditioning. Here are the average temperatures of Taipei. Here 2,400 mm (95 in) of rain fall per year, with a peak in the hottest period, from June to September. Here is the average precipitation. However, there is no dry season in Taipei, and the sky in winter is often cloudy. In fact, the winter monsoon, which is originally dry as it comes from the Asian mainland, picks up moisture over the sea and brings clouds, mists and some rain in the northern part of the island. Even in spring, the sun is rarely seen. Overall, Taipei is a dull city: in a year, there are only 1,400 hours of sunshine. Here are the average sunshine hours. Along the northern coast, the sea is warm enough for swimming from May to October, while in winter, it becomes very cool, as we can see from the sea temperature near Keelung, about 20 kilometers (12 miles) northeast of Taipei. As mentioned, winter is warmer in the south, as we can see from the average temperatures of Tainan. In Tainan, on the south-west coast, 1,700 mm (67 in) of rain fall per year, and the dry season is long, from October to March, while showers begin to increase in April. Here is the average rainfall. In Tainan, and in general in the south, the winter, in addition to being drier, is also sunnier than in Taipei. In Tainan, there are 2,200 hours of sunshine per year. Along the south coast, the sea is warm enough for swimming all year round. In winter, however, the air temperature, though mild, is a bit low for swimming and sunbathing, even in the south. Here is the sea temperature in Tainan. The interior of the island is occupied by mountains. The highest point is Yushan, 3,952 meters (12,966 feet) high, whose name, "Jade Mountain", derives from the contrast created in winter between the snow-capped peak and the sky in the background. Above 2,000 meters (6,500 feet), winter is quite cold, and there's some chance of snow and frosts, while summer is cool but very rainy. On the top of Yushan, the average temperature in the winter months is around freezing, while in summer, it is around 8 °C (46.5 °F). On average, precipitation amounts to as many as 3,000 mm (118 in) per year, with a remarkable maximum in summer, while snow is frequent in winter. Here are the average temperatures. To the west of Taiwan, in the strait that separates it from China, we find the Penghu Islands, called Pescadores in the Portuguese era. On these islands, winter is quite cool and windy, and although the rains are not abundant, the sky is often cloudy and a light rain can fall. In contrast, summer is hot, muggy, and rainy, even though the sun shines for a good number of hours. Here are the average temperatures of the largest city of the islands, Magong (or Makung). These islands are not as rainy as the main island of Taiwan, since they receive about 1,000 mm (40 in) of rain per year. Here is the average rainfall in Magong. Although it's the wettest period, the sun shines more often in summer; in fact, in this period, apart from thunderstorms, the weather tends to be good. The sea temperature, a little cool from December to March, becomes pleasantly warm for swimming in the summer. As mentioned earlier, Taiwan can be hit by typhoons, the tropical cyclones of Southeast Asia; actually, Taiwan is one of the most affected countries, also because the mountains that cross the island create the conditions for torrential rains: it is not by chance that in some places, during the most intense typhoons, a total of more than 1,000 mm (40 in) of rain has fallen in a few days. Typically, typhoons occur in this area from June through October, although they are more frequent from mid-July to early October. Recently, however, perhaps because of global warming, they have sometimes affected the country outside of this period, though without reaching high intensities, as happened with Typhoon Kujira in late April 2003, with Typhoon Chanchu in May 2006, and with Typhoon Nanmadol in early December 2004. The best time to visit Taiwan runs from November to March, since it is the mildest and outside of both the monsoon rains and the typhoon season. The east coast, however, is very rainy still in November. For a beach holiday at the Penghus, the best time is the summer, although it should be remembered that it is the period when typhoons can affect the area. In winter: pack spring/autumn clothes, a sweatshirt or sweater, a light jacket, and a raincoat or umbrella. For the high mountains, a down jacket, a rain jacket, a hat, gloves, and a scarf. In summer: pack tropics-friendly, loose-fitting clothing, a light sweatshirt and a light scarf for air-conditioned places, and a light raincoat or umbrella. For the high mountains, a warm jacket, a rain jacket, and hiking boots.